This year’s recipient of the ALBA/Puffin Human Rights Award is the Coalition of Immokalee Workers, a worker-based labor and human rights organization founded in Florida in 1993. On March 6, 1930, over one million people took to the streets across the United States in the first major organized protest of the Great Depression. Women and men of all ethnic and racial backgrounds congregated to demand unemployment relief and protest evictions. The largest demonstration took place in New York City’s Union Square, where tens of thousands battled police in an attempt to march down Broadway to bring their demands to City Hall. Among the many were three future Lincoln Brigaders, Lou Gordon, Abe Smorodin and Saul Wellman, who had cut classes from Boy’s High School in Brooklyn to attend. Years later, Wellman recalled how the reality of widespread economic hardship combined with the understanding of the power of collective action turned him into a “professional revolutionary.” The youthful ardor that led them to take to the streets of New York in 1930 saw them, along with thousands of other women and men from around the world, on the front lines of the battle against oppression and exploitation in Spain seven years later. Shaped by their consciousness of the inequities produced by capitalism, the three young men spent their lives fighting for social justice and human dignity. 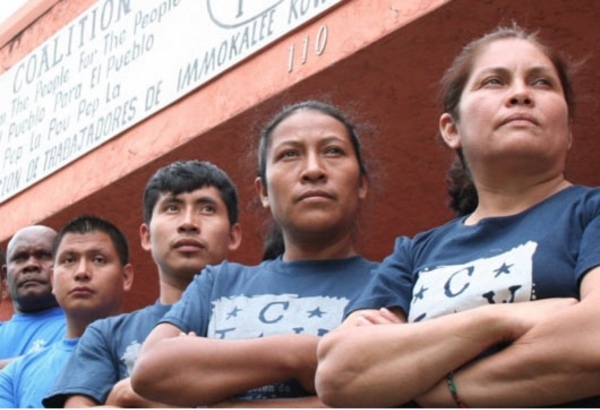 Founded in 1993 in Immokalee, Florida, the CIW is a worker-based labor and human rights organization. It began its activities by organizing protests against wage cuts and the use of violence by supervisors against field workers. In 2005—after numerous strikes, marches, a nationwide boycott of Taco Bell and a 30-day hunger strike—the CIW secured major wage increases and the implementation of the Fair Food Program (FFP), a strict code of conduct governing working conditions for farm workers. While continuing to organize for fair wages and better working conditions, the CIW turned its attention to a campaign to eliminate modern-day slavery in the agricultural industry, under which workers are held against their will by violence or the threat of violence, including beatings, shootings, and pistol-whippings. The CIW’s Anti-Slavery Campaign has uncovered, investigated, and assisted in the prosecution of numerous multi-state farm slavery operations across the Southeastern U.S., helping to liberate over 1,200 workers held against their will since the early 1990’s. CIW also pioneered the worker-centered approach to slavery prosecution, playing a key role in the passage of the 2000 Trafficking Victims Protection Act, and advocating for solutions to prevent and end all forms of human trafficking and modern slavery around the world. Lou, Abe and Saul, and many others like them, understood the connection between social inequality and the rise of oppressive regimes. With this award ALBA honors their memory and renews its commitment to supporting ongoing struggles against exploitation in the United States and across the globe. 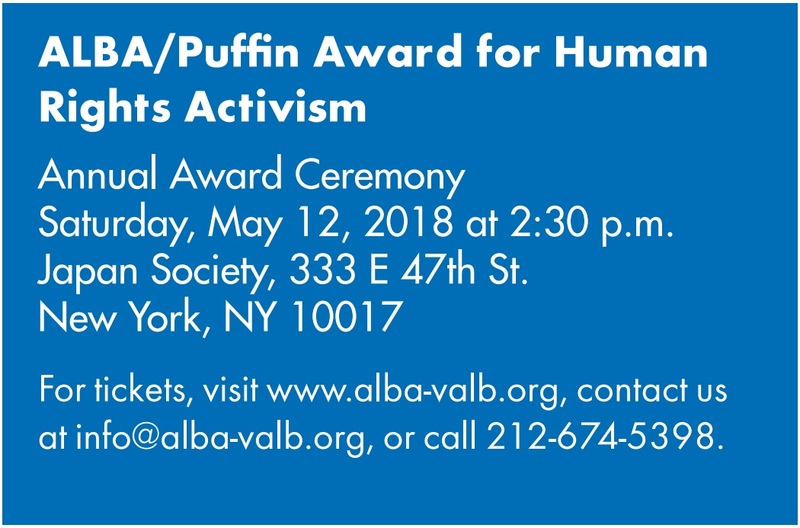 One of the largest monetary awards for human rights in the world, ALBA/Puffin Award for Human Rights Activism is a $100,000 cash prize granted annually by ALBA and the Puffin Foundation in honor of the 3,000 Americans who volunteered in the Spanish Civil War (1936-1939) to fight fascism under the banner of the Abraham Lincoln Brigade. The award was created by visionary and philanthropist Perry Rosenstein, President of the Puffin Foundation, which established an endowed fund for this human rights award in 2010.